Chris Petersen Joins Invitation-Only Community of World-Class CIOs, CTOs and Technology Executives. At Scientist.com, new technologies are helping us re-define how pharmaceutical and biotech research is done. Scientist.com, the life science industry's leading online marketplace for outsourced research, announced today that CTO and Co-Founder Chris Petersen is now a member of the Forbes Technology Council, a community of hand-selected CIOs, CTOs and technology executives whose insights on industry topics are published on Forbes.com. 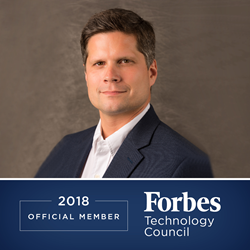 "I am delighted to join the Forbes Technology Council and contribute to the conversation on how to use technology to improve business performance and efficiency," said Chris Petersen, Scientist.com's CTO and Co-Founder. "At Scientist.com, new technologies are helping us re-define how pharmaceutical and biotech research is done, reducing costs, saving time and enabling access to cutting-edge innovations." Forbes Councils combines an innovative approach to community-specific content management perfected by the team behind Young Entrepreneur Council (YEC) with the extensive resources, global reach and reputation of Forbes. As a result, Forbes Council members have access to the people, benefits and expertise they need to grow their business while sharing insights with peers and the public. Scott Gerber, founder of Forbes Councils said, "We are honored to welcome Chris Petersen into the community. Our mission with Forbes Councils is to curate successful professionals from every industry, creating a vetted, social capital-driven network that helps every member make an even greater impact on the business world." Scientist.com is the world's leading marketplace for outsourced research. The marketplace simplifies the entire research sourcing process, saving time and money and providing access to the latest innovative tools and technologies while maintaining full compliance with an organization's procurement policies. Scientist.com operates private enterprise marketplaces for most of the world's major pharmaceutical companies, VWR and the US National Institutes of Health (NIH). Since its founding in 2007, Scientist.com has raised more than $33 million from Leerink Transformation Partners, 5AM Ventures, Heritage Provider Network, Bootstrap Ventures and Hollywood producer Jack Giarraputo among others. Visit scientist.com to learn more.